In today's Living a Better Life, we take a look at the benefits of working out with your partner as a couple. Hitting the gym. Breaking a sweat. Dancing. Hiking. You name it! Working out with your partner has benefits. With Valentine’s Day fast approaching, many couples are planning to spend time together. But have you have thought about making a date…at the gym? At Steve Alley’s Body of Learning gym in Beverly Hills, morning exercise regulars are likely to run into Audrey and Lawrence James. The couple is celebrating their 10th wedding anniversary this year and also their 10th anniversary of working out together. Going to a high-intensity interval training class in the morning is just one of the many exercise activities they share. “I used to not like running, and I started running because he likes it. And now I like to run. And then, you know, he’s more into upper body workout. I’m more into lower body work out, but he comes and does the “booty” [class] with me if he has to,” explained Audrey with a smile. The two of them workout as a pair about four-to-five times a week. And they motivate each other. And the benefits aren’t bogus. Dr. Carol Weisfeld – author and psychology professor at University of Detroit Mercy – has studied couples around the world for 30 years. 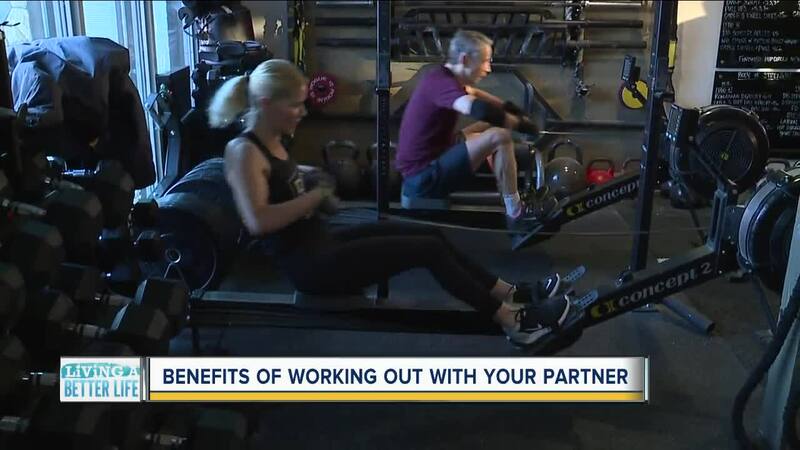 She told 7 Action News that exercising together strengthens your emotional bond with your partner because you’re committing the time to each other. It’s a date, and you’re taking this time to take care of each other. Working out with your mate also builds mutual appreciation because you’re learning new things about your partner’s goals and capabilities. Dr. Weisfeld said when you discuss your goals and listen to each other, you learn new things about your partner. And Dr. Weisfeld added that exercising together boosts the physical attraction that you feel for each other. “We know that physical attraction remains important in a relationship all the way through to old age. So, no matter what your age, you can strengthen that sense of attraction by putting both of your bodies into a common workout,” explained Dr. Weisfeld. With the soreness and aches that often can come with a good workout, now you have somebody to commiserate with you. Just another plus for this pair as they grow stronger together. “I would highly recommend for couples to work out together. It brings you closer,” Audrey added. Granted, you don’t have to spend every waking moment – or workout --with your partner. Lawrence says he and Audrey do about 80-percent of their workouts together and the other 20 percent on their own. You just have to find what works for you and your relationship. My husband and I juggle vastly different work schedules, but one of our favorite things to do together is to go for a walk in the mid-afternoon or on the weekends. We also love dancing. That’s how we met. If you are not in a romantic relationship, having a friend or an accountability partner can also lead to a stronger and more successful workout routine. It can also open up your social circle. Alicia Smith is the weekday morning anchor at WXYZ in Detroit. Her “Living a Better Life” stories air each Tuesday at 6:00am & 4:00pm on WXYZ.